'Uncle Jim' (James T Owen) was a game reserve warden who lived on the North Rim of the Grand Canyon for over ten years at the start of the last century, responsible, amongst other things, for killing over 500 mountain lions, in a (misguided) attempt to protect the local population of mule deer. The viewpoint commemorating Uncle Jim is reached by a 5 mile loop trail of the same name, beginning at the roadside parking area also used for the North Kaibab Trail - on the North Rim Parkway 2 miles before it ends at Grand Canyon Lodge. This is a popular hiking location, and the car park often fills up by mid morning on busy summer days, so late arrivals have to leave vehicles up to a quarter mile away alongside the highway. The trailhead is at the far side of the carpark, next to the staging area for the mules that take guests down both the North Kaibab and Uncle Jim trails; this is also the start point for the Ken Patrick and Old Kaibab routes (see trail index). An NPS information board by the start of the path has detailed maps of the area, plus various other notices. Uncle Jim Trail begins by climbing gently amongst the tall trees, running quite close to the rim and offering partial views down Roaring Springs Canyon before turning more to the north and entering deeper forest of mixed aspen, fir, spruce and ponderosa pine, through some parts that show quite extensive wildfire damage. The path crosses a small stream, climbs the far side then levels out, soon reaching a junction. The Ken Patrick Trail leads straight on - a much less used path (and no mules allowed) - while the Uncle Jim Trail continues to the right, descending quite steeply into a cool, moist area that holds melting snow well into June. After a short but equally steep climb up the far side, the trail divides again at the start of the loop section. 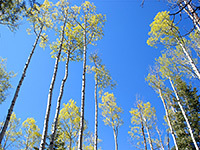 Both branches reach the viewpoint after less than a mile; the left part is more level and passes close to the edge of the plateau, while the right part offers no canyon views and has a few short climbs and descents. The 5 mile round trip to this point can be done in as little as 90 minutes owing to the gentle gradients and shady conditions, though the NPS give 3 hours as the suggested time. At the end of the loop trail (marked by a mule tethering frame), a fainter, hiker-made path leads down the exposed hillside a little way, until the bushy vegetation fades away and the canyon ahead is in full view. 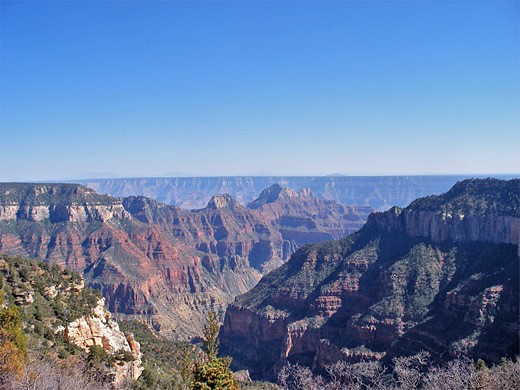 This is not the main Grand Canyon, however, just the upper few miles of the Bright Angel tributary. 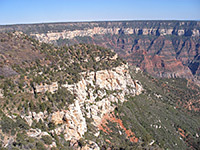 A short section of the South Rim is visible in the distance, but most of the Colorado gorge is hidden, behind the Walhalla Plateau in the east and Bright Angel Point in the west. Uncle Jim Point also overlooks the first few miles of the North Kaibab Trail, switchbacking several thousand feet down Roaring Springs Canyon.